Isfryn Cottage01650 511463work Self-cateringA very warm welcome to Isfryn from your hosts Steve and Linda. 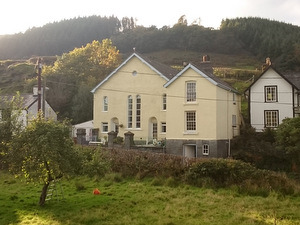 Isfryn (which means 'under the hill' in Welsh) is a completely self-contained cottage adjoining the former Methodist chapel Hebron, which is now our home. The properties are separated by three-feet thick walls of slate, ensuring your privacy. We will gladly offer any help and advice that you need during your stay, but will otherwise leave you undisturbed (apart from friendly greetings when we meet!) to enjoy your cottage and your holiday. Isfryn was built in the 1870s as a home for the chapel minister. We bought it in June 2015, when it was in a very neglected state. It was renovated over the following 6 months and was opened for visitors in Spring 2016. Renovating this cottage has been a very happy experience, which we hope is reflected in its cheerful and welcoming interior. It offers cosy and comfortable accommodation for up to four adults. In the living room, the most prominent feature is an open hearth with beautiful, local slate hearth stones, which connects this room with the dining room beyond. It contains a double sided wood burner, so you don't need to leave your warm and cosy fire behind when you go to eat at the table! The living room has two comfortable two seater sofas, satellite TV, free WiFi, DVD player, a selection of DVDs and well stocked book shelves. In the bureau, you will find a variety of games, so in the event of inclement weather (what's known as a 'soft day' in Wales! ), you can settle comfortably indoors and be well entertained. As with the rest of the house, the walls are decorated with original prints, many by local artists. In the living room, you will find two USB charging sockets so that you can conveniently charge up any electronic items. The dining room furniture, which dates from the mid 1800s, was bought by Linda with money left to her by her grandmother and was used in her own house for many years. We are delighted to share it with you now and hope you enjoy the presence of furniture appropriate to the age of the cottage. If you like music to dine by, you will find a CD player and a variety of CDs on the buffet stand. We have tried to make maximum use of the space in Isfryn to offer you everything you need for your holiday. In this spirit, in the cupboard under the stairs you will find a washer/dryer, washing liquid and fabric conditioner, a table top dishwasher, an iron and a table top ironing board. The newly fitted kitchen has an induction hob, electric oven, microwave, fridge with a small freezer compartment and a kettle. It will be stocked with living herb plants for your arrival and you'll find the basics like tea, coffee, sugar, cooking oil, salt and pepper, cling film and foil waiting for you. A rear porch completes the ground floor and offers coat hooks and a boot rack for muddy or wet footwear. Upstairs, the bedroom contains a super-comfy, super-king sized bed which can be converted to twin beds if desired. There is a charming, up-cycled wardrobe dating from the era when it was felt useful to have shelves labelled to tell you where to keep your socks and underwear! In the bedside table drawers, you will find a hairdryer, and a cooling mat in case you bring your straighteners. There is another well-stocked book shelf to make sure you can read yourself into a peaceful sleep. The large landing houses a big day-bed, which acts as a sofa when only two adults are staying, giving you an additional sitting room. As of February 2018, we will only be offering the cottage to parties of two adults, although we will of course honour all forward bookings for four. When four people are staying, the day bed converts into a very comfortable super-king sized bed, afforded privacy by folding screens. The screens surround the bed but still allow easy access to the bathroom. Yet another bookshelf ensures that passing comfortable afternoons curled up on the day bed lost in a good book, or reading yourself to sleep is also an option here. The newly fitted bathroom has a large, walk in shower with both drench and hand held shower heads, a toilet, a heated towel rail, an illuminated mirror with shaving point and a magnifying mirror. You will find cotton wool, cotton buds, tissues and other basics here, as well as a welcome pack of toiletries. We provide all bed linen, a choice of pillows, towels, tea towels and waffle-weave bathrobes for your comfort. Because there are steep stairs inside and steps leading to the front door, we regret to say that Isfryn may not suit you if you would have difficulty with these. A very warm welcome to Isfryn from your hosts Steve and Linda. 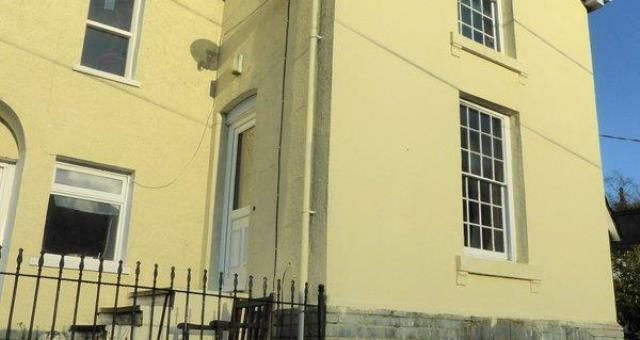 Isfryn (which means 'under the hill' in Welsh) is a completely self-contained cottage adjoining the former Methodist chapel Hebron, which is now our home. The properties are separated by three-feet thick walls of slate, ensuring your privacy. We will gladly offer any help and advice that you need during your stay, but will otherwise leave you undisturbed (apart from friendly greetings when we meet!) to enjoy your cottage and your holiday. There is parking on the driveway for one small/medium car and plentiful parking within 50m on the quiet lane. Children welcome from any age. If coming from the East via Welshpool on the A 458 then follow the A458 to its end at Mallwyd and the junction with the A470. The Brigands Inn is on the roundabout and easy to spot. Turn Left at the roundabout onto the A470 towards Machynlleth and follow it for 1 mile until you see the sign for Aberangell. Take the Aberangell turning, over the bridge and past some caravans to a crossroads. At the crossroads turn left and Isfryn is 100m up the road on the right. See below for parking recommendations. If coming from the East via Newtown on the A 470 then stay on the A470, turning right at the roundabout in Cemmaes Road (signposted Dolgellau). Continue through the villages of Cemmaes & Cwm Llinau until you see the sign for Aberangell. Take the Aberangell turning, over the bridge and past some caravans to a crossroads. At the crossroads turn left and Isfryn is 100m up the road on the right. See below for parking recommendations. If your car is small enough, you are welcome to park in our driveway, otherwise you can park in front of the small terrace next to the cottage or close to the bridge, 50m from the cottage. If you are arriving by public transport, we can arrange to collect you from the railway station or bus station in Machynlleth. We can also arrange to drop you back at the station for your return trip. We are very sorry that, as Isfryn is an old property with steps to access it and a steep stairs, it will not be suitable for anyone who would have difficulty with these. We also regret that, as we need to be aware of the potential allergies of guests, we have made a decision not to accept animals at Isfryn and that this should include assistance dogs.